Johannesburg - Safa is confident Fifa could either rescind Bongani Zungu’s red card or reduce his possible two-match suspension. The Bafana Bafana midfielder will know after Wednesday if his appeal is successful or not. Safa confirmed it has appealed his sending off against Burkina Faso last weekend. Safa is even willing to pay a fine for the midfielder. Zungu faces a two-match suspension for violent conduct for retaliation after Burkina Faso’s Alain Traoré elbowed him. If his appeal is not successful, he will miss Bafana’s two 2018 World Cup qualifiers against Senegal next month. Safa’s chief executive Dennis Mumble said they were positive of a successful appeal and believed their mitigating circumstances were strong. Mumble said they decided to appeal after receiving correspondence from Fifa regarding the sending off. “It is standard procedure for Fifa to send correspondence after going through the referees’ reports to inform member associations of any red cards and ask if they want to appeal before the disciplinary committee (DC) sits,” said Mumble. “We believe we have a strong case as we have video evidence. In our mitigating circumstance we are saying Fifa cannot lengthen the suspension". They would ask the Fifa DC to take action against Traoré, who provoked Zungu by elbowing him, and against a ­Burkinabé official who stormed onto the field to confront Bafana players. Mumble said Safa would definitely pay any monetary fine that Zungu might get. But he was non-committal about Eric Mathoho’s R70 000 fine by Fifa after his red card against Cape Verde last month. 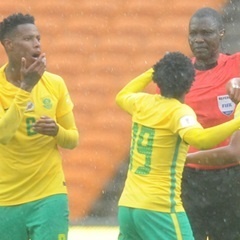 He said he was awaiting feedback from coach Stuart Baxter and team manager Barney Kujane about whether Mathoho’s misdemeanour was the result of ill-discipline. “At worst we might split the costs, but I’m meeting with the coach next week to go through it. Disciplinary measures are the coach’s responsibility, but where we clearly can’t hold the player liable we will pay". Bafana will welcome back defender Mathoho following his two game suspension and Dean Furman, who had to sit out one game. Baxter will be without Andile Jali and Zungu for the clash against Senegal. Bafana need to win their remaining two games against Senegal to book a ticket to Russia. On the other side, Senegal need just a point to secure their place in the finals. Mathematically, the other two countries – Burkina Faso and Cape Verde – are not out of contention but will need a miracle for either to book a place in the finals. They will cancel each other in their final game in Ouagadougou next month. The winner of this clash will finish the campaign on nine points, but that won’t be enough to send them through because of their inferior goal difference. Burkina Faso would have to win by an avalanche of goals and hope Senegal drop four points. The same applies to Cape Verde who need to win by at least eight goals to make up for their inferior goal difference. It is all in Senegal’s hands to make it as they have two chances to secure their place. With eight points in the bag, they could seal it with a draw in the replay against Bafana, failing which they would get another chance in front of their home supporters in the ­return leg.
. PSL chair Irvin Khoza on Saturday paid tribute to the late football administrator Dan Leboa, who passed away on Friday. He was an Orlando Pirates official and later the National Professional Soccer League Chief Gate Controller and finally the PSL’s General Manager of Football. “Mr Dan Leboa served football with respect and dignity. He represented longevity in football and was an institution. "We would like to thank his family for allowing Mr Dan Leboa to serve the game. We also thank him for his dedication to serving people and football. May his soul rest in peace,” Khoza said in a statement issued by the league.